You will find below the horoscope of Brooke Adams with her interactive chart, an excerpt of her astrological portrait and her planetary dominants. If you know the time of birth of Brooke Adams, we would appreciate it if you would send us your information with your source, at stars@astrotheme.com. To thank you for contributing to the enhancement of our astrological database, we shall be glad to send you the astrological portrait (34 pages) of this celebrity. Horoscopes having the same aspect Mars trine Uranus (orb 0°49'): Brad Pitt, Napoleon I, Gerard Butler, Adriana Karembeu, Ingrid Chauvin, Michael Fassbender, Jennifer Garner, Carmen Electra, Anna Nicole Smith, Lance Armstrong, Sylvia Plath, Carrie Underwood... Find all the celebrities having this aspect. Horoscopes having the same aspect Moon sextile Pluto (orb 2°09'): Justin Timberlake, Will Smith, Zac Efron, Katie Holmes, Romy Schneider, Bono (U2), Joan Baez, Osama bin Laden, Sean Penn, Charlène, Princess of Monaco, Marie Curie, Aleister Crowley... Find all the celebrities having this aspect. Celebrities born the same day: James Dean, Jules Verne, Mathilda May, Dmitri Mendeleev, Lana Turner, Seth Green, Nick Nolte, William Tecumseh Sherman, Jack Lemmon, Baronne Marianne von Brandstetter, Gary Coleman, John Williams... List of all the celebrities born on February 8. Celebrities clicked on in real-time: 576,845,130 times. Brooke Adams (born February 8, 1949 in New York) is an American actress. Adams attended the High School for the Performing Arts and the School of American Ballet. After playing small roles in television and low-budget movies, Adams' performances in Days of Heaven and the remake of Invasion of the Body Snatchers (both 1978) brought her positive reviews. She has also starred in the films Cuba (1979), The Dead Zone (1983), Key Exchange (1985), and Gas Food Lodging (1992). From 1995 she temporarily retired from film-making due to family responsibilities and a dearth of good roles, resuming her career around 2002. In 2002 she received rave reviews for her performance in the romantic comedy Made-Up, which was written by her sister, actress Lynne Adams and directed by her husband Tony Shalhoub, star of Monk. Here are some character traits from Brooke Adams's birth chart. This description is far from being comprehensive but it can shed light on his/her personality, which is still interesting for professional astrologers or astrology lovers. 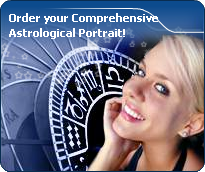 In a matter of minutes, you can get at your email address your astrological portrait (approximately 32 pages), a much more comprehensive report than this portrait of Brooke Adams. Warning: when the birth time is unknown, which is the case for Brooke Adams, a few paragraphs become irrelevant; distributions in hemispheres and quadrants are meaningless, so are dominant houses and houses' accentuations. Therefore, some chapters are removed from this part. Cheers for communication and mobility, Brooke Adams! The predominance of Air signs in your chart favours and amplifies your taste for relations and for all kinds of short trips, whether real (travels) or symbolic (new ideas, mind speculations). You gain in flexibility and adaptability what you lose in self-assertion or in pragmatism. Like the majority of Earth signs, Brooke Adams, you are efficient, concrete and not too emotional. What matters to you is what you see: you judge the tree by its fruits. Your ideas keep changing, words disappear, but actions and their consequences are visible and remain. Express your sensitivity, even if it means revealing your vulnerability. Emotions, energy and communication must not be neglected; concrete action is meaningless if it is not justified by your heart, your intellect or your enthusiasm. Fire's qualities are not very present in your chart, with only 8.22% instead of the average 25%, which means that you may lack warmth, enthusiasm, conquering spirit, or energy. You may look indifferent to others, with almost no desire, no joy of life or no enterprising ability. Actually, it is not true, but you should let go, force yourself to be more daring, and show your amazement as well as your vitality. You certainly have as much energy as others, you just need to release it, and it is up to you to display more of it, since it will be all to your benefit: shout, sing, pull faces, dance! That's the right mean for you... In the end, you'll never be accused of being sad, phlegmatic or a killjoy! In your natal chart, the three most important signs - according to criteria mentioned above - are in decreasing order of strength Aquarius, Gemini and Leo. In general, these signs are important because your Ascendant or your Sun is located there. But this is not always the case: there may be a cluster of planets, or a planet may be near an angle other than the Midheaven or Ascendant. It may also be because two or three planets are considered to be very active because they form numerous aspects from these signs. After this paragraph about dominant planets, of Brooke Adams, here are the character traits that you must read more carefully than the previous texts since they are very specific: the texts about dominant planets only give background information about the personality and remain quite general: they emphasize or, on the contrary, mitigate different particularities or facets of a personality. A human being is a complex whole and only bodies of texts can attempt to successfully figure out all the finer points. You are a “free-thinker”, Brooke Adams, and you tackle problems with a swift and efficient mind. Freedom, progress and originality are your driving forces. You are resolutely future-oriented and with ingenuity and inventiveness, you reform what is outgrown and you constantly innovate: psychology, computer sciences, new technologies... have almost no secret for you. Your human and idealist qualities are obvious, you are a very pleasant and interesting interlocutor, even though your rebellious and revolutionary side may be criticized. Indeed, you seem to be driven by a strong argumentativeness: you seldom share your friends' views and, although you may come across as obstinate, intransigent and unpleasant, you do not hesitate to speak the truth! Instead of causing sudden break-ups with your friends, it is advisable that you express your creative potential more persistently whenever your nervous tension is too high. In love, you are more cerebral and friendly than really passionate, Brooke Adams. You are made for amorous friendships, for refined and light feelings where each partner retains one's freedom, and almost detachment, without getting really committed. Sometimes, you may be distant from, and indifferent to, love matters for a while, because you can be completely engrossed in original intellectual pursuits and the collective atmosphere which you are so fond of. You substitute a great number of friendly and light contacts to amorous relationships and it is fair to say that they satisfy you. To fall in love, you need spice and a partner who is original, who amazes you and whom you admire; under such conditions, you can freely express your feelings in an ambiance devoid of constraint, where freedom is perfectly respected and shared within the couple. Brooke Adams, the way you take action is quite paradoxical: you carry out your business perfectly well when you are in a teamwork with collective goals, but you do so in your original and individualistic manner: this is your main peculiarity. Your concern is to express your originality and your specificity while remaining immersed in a human community. You are curt and not very flexible. You are inventive and you easily fight authority, just because its very principle runs counter to the sacred values of freedom, independence and, above all, the absence of constraint. Competition does not appeal to you. You prefer to be useful and to conquer new territories of the humanitarian or the intellectual type. On the sexual plane, you are also often original and surprising regarding your fantasies and your tastes. This text is only an excerpt from of Brooke Adams's portrait. We hope that it will arouse your curiosity, and that it will prompt you to deepen your knowledge of astrology, as well as to visit and use the wide range of free applications at www.astrotheme.com.